Why are first-floor flats some of London’s most desirable homes? All over London throughout the eighteenth and nineteenth centuries terraces of grand townhouses were built. Now though most have been divided into flats and it is invariably the first-floor flat, the one with the highest ceilings, that commands the most interest. 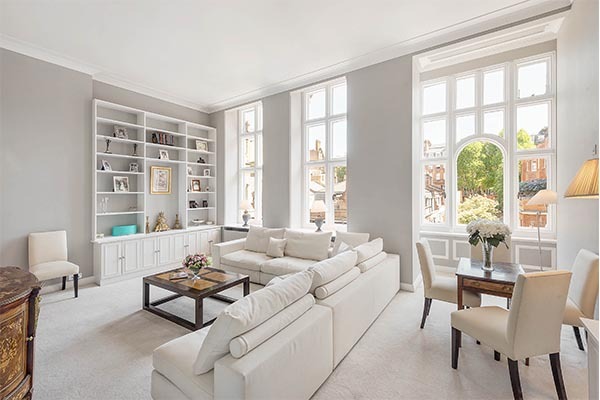 In many cases, the apartments started out life as one or two rooms of these grand London townhouses, in the days when wealthy families and their staff occupied the entire property. The first floor, traditionally, was where any formal entertaining was done, which called for rooms with high ceilings, crystal chandeliers, ornate fireplaces and large floor-to-ceiling windows, preferably opening out on to a balcony overlooking gardens. Many of these features have survived the test of time and attract potential buyers to first-floor flats today. Even if the flat only has two, comparatively modest bedrooms, that spacious, airy drawing-room is instantly seductive. In the late nineteenth and early twentieth century traditional townhouses were replaced in some parts of London by red brick mansion blocks with individual apartments. But again, the builders located the most prestigious, spacious apartments on the first floor, not the ground floor. Generously proportioned first-floor flats are also perfectly suited to the current trend for lateral living. The height of cool, for many, is now a vast lateral apartment on the first floor, with soaring ceilings, four or five bedrooms and stunning views.